Dr. S. Darrell Lee Donates to Boys & Girls Clubs. 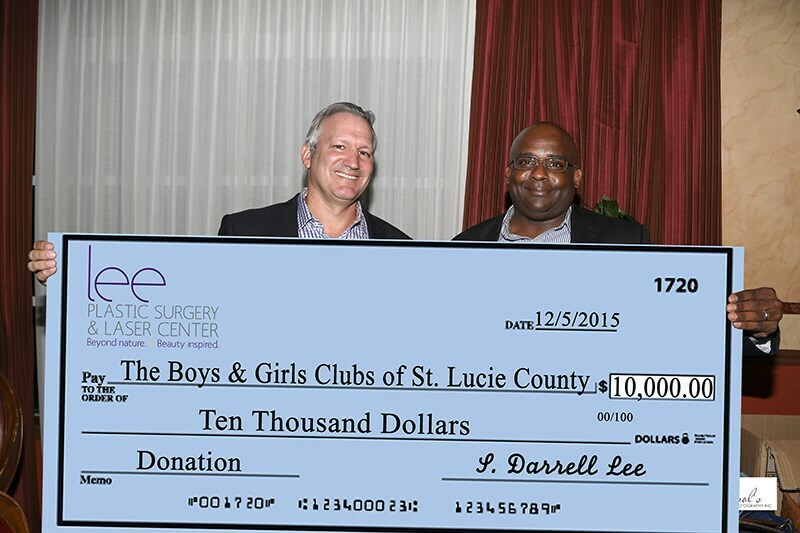 Dr. S. Darrell Lee, Founder of Lee Plastic Surgery and Laser Center has donated $10,000 to the Boys & Girls Clubs of St. Lucie County. Dr. Lee is a strong supporter of the organization. This is the 2nd year in a row he has made the donation. school with a plan-for-the-future, demonstrating good character and citizenship and living healthy lifestyles. The Club enables all young people, especially those who need us most, to reach their full potential as productive, caring, responsible citizens. With sixteen locations throughout the county, the Boys & Girls Clubs programs serve a diverse group of kids age 5-18. The 3,000 members come from a variety of backgrounds. For more information, please call (772)460-9918, or visit www.bgcofslc.org. Dr. Lee is owner/founder of Lee Plastic Surgery and Laser Center in Port St. Lucie. He is an accomplished Board Certified plastic surgeon. Dr. Lee is a graduate of New York Medical College where he completed his medical school and residency training in General Surgery. He earned his Board Certification in General Surgery from the American Board of Surgery and completed his Fellowship in Plastic Surgery at the World Renowned Mayo Clinic in Rochester, Minnesota. Lee Plastic Surgery & Laser Center is an award-winning medical practice that has been recognized with the Patients Choice Award, Most Compassionate Doctor, Best Plastic Surgeon and People’s Choice Awards. Dr. Lee has over 24 years of experience. He is committed to our community and helping those in need.